"If we do not confess Jesus Christ, nothing will avail." (Vatican Radio) Pope Francis celebrated the Missa pro Ecclesiae in the Sistine Chapel on Thursday afternoon. 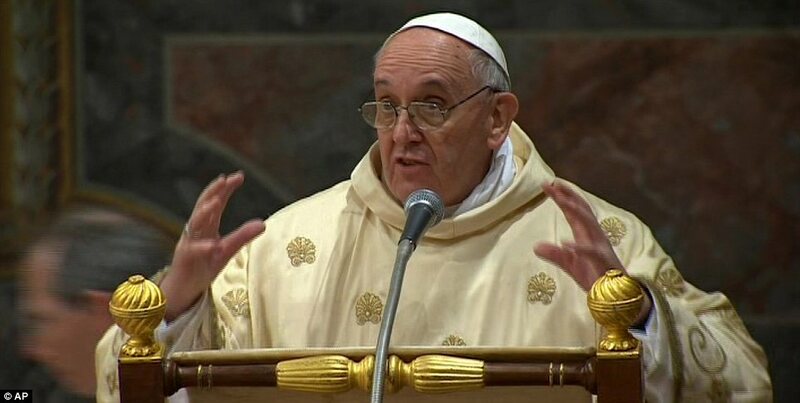 Below, please find Vatican Radio’s translation of the full text of his homily. Third, professing: we can walk as much we want, we can build many things, but if we do not confess Jesus Christ, nothing will avail. We will become a pitiful NGO, but not the Church, the Bride of Christ. When one does not walk, one stalls. When one does not built on solid rocks, what happens? What happens is what happens to children on the beach when they make sandcastles: everything collapses, it is without consistency. When one does not profess Jesus Christ - I recall the phrase of Leon Bloy – “Whoever does not pray to God, prays to the devil.” When one does not profess Jesus Christ, one professes the worldliness of the devil. Walking, building-constructing, professing: the thing, however, is not so easy, because in walking, in building, in professing, there are sometimes shake-ups - there are movements that are not part of the path: there are movements that pull us back. I would like that all of us, after these days of grace, might have the courage - the courage - to walk in the presence of the Lord, with the Cross of the Lord: to build the Church on the Blood of the Lord, which is shed on the Cross, and to profess the one glory, Christ Crucified. In this way, the Church will go forward.